I had spent my lifetime thinking very intensely about films I was passionate about. I commonly kept those thoughts inside my vessel because when I exercised this nerdy endeavor in front of others, it was commonly met with odd looks of disdain. What I understood early on in my most fragile of formative years was that horror was the stepchild you only brought out of the basement when company left your home. The exuberance it gave me did nothing for my social IQ, and without any desire to “fit in,” I kept my love of the genre confined to my head and television on the weekends. This intensity helped me produce some of my best papers in college and not long after, check out the virtual activity of blogging. In the beginning, I knew I had a lot to say about the horror films I loved, and realized that my approach to film criticism was slightly different. Looking back, I saw my written work as both intimate explorations and assertions for a particular film’s merits. This was done with much fervor. Because horror films, although numerous books, articles, and essays were written about the genre and have great fans doing the same, weren’t taken seriously. It was comments from acquaintances and random people who told me my approach was something special that propelled me to do more. I was channeling all of the energy that I had built up since a child with no social outlet for my horror fandom and using this as a space for its release. It wasn’t until I began Graveyard Shift Sisters that my voice as a film critic became a bit more refined. This was the natural next step in my evolution because as a black woman, I was starting to become discontent with the lack of dialogue on or visual representation of women of color in horror and wanted to do more than focus on our victimhood in these narratives. I imagined that there was more of a variety of our history in the genre and the importance of highlighting characters and stories that moved beyond stereotypes, addressed them, or mirrored them with alternative perspectives. As a black woman film critic, it was even more imperative for me to do a lot of research if I was going to challenge popular notions of black representation in horror cinema. I also wanted to add my personal touch; what scares me and who were the characters and their traits that I vulnerably and confidently saw in myself. It was how films had always resonated with me, but I could now add how, when, and why the image of a black woman in these narratives was important to examine within the spectrum of history. 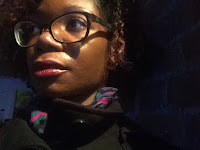 Initially, I wanted to connect with Zena from The Real Queen of Horror and Penna of Pixie’s Horror Galore, being as they are the only two black women horror film bloggers out there I was aware of when Graveyard Shift Sisters was birthed in October 2013. Their enthusiasm for the genre was exciting and gave me the extra push to niche out my own little corner of horror film criticism. With their work in mind, I cannot stress how important Twitter has been to my perception of film and influence. It is my daily interaction with and observation of other women of color who genuinely love horror that hold nothing back with their critiques and praises. I’m so thankful for their presence and their voices because they help me understand that I was never alone and expand the perceptions of horror film criticism. I never wanted to be, and still don’t think I am, “the voice of” or “authority” on anything necessarily as I more so see my work as a film critic like the dissertation that’ll never get me a Ph.D. (because I’m still very much an academic at heart). I offer a portion of horror film criticism that celebrates the overlooked roles of black women for far too long. With many more independent women of color filmmakers creating speculative films, this is an exciting time to be in a film critic division where race and gender are interlocked, embraced, and addressed on multiple levels. I am thrilled about the possibilities of looking at more film projects where their creativity brings something fresh to the horror genre and hopefully, are given the recognition they richly deserve. blog dedicated to highlighting women of color in the horror and science fiction genres. She’s a BA/MLA graduate of Temple University and has written for Shock Til You Drop, Paracinema, Shadow And Act, and Black Girl Nerds. Additionally, she serves as an Associate Editor of Ax Wound magazine and works closely with the international movement, Women in Horror Month. Follow Ashlee on social media: Twitter, Tumblr, Facebook, Instagram. Good post! I'm glad to know that WoC film critics are out there sharing their perspective in the horror genre. I like reading Ashlee's Twitter feed even though I'm a scaredy cat when it comes to most horror flicks.